Sahayam Intervention Centre is a registered one-stop intervention centre for emotional enrichment for one and all. Sahayam follows an integrated holistic approach by blending conventional psychological therapies with complementary healing systems.The mission of organization is to enhance the mental health status of the society by reaching out to every individual irrespective of age, gender, class or creed through individual consultations and workshops. 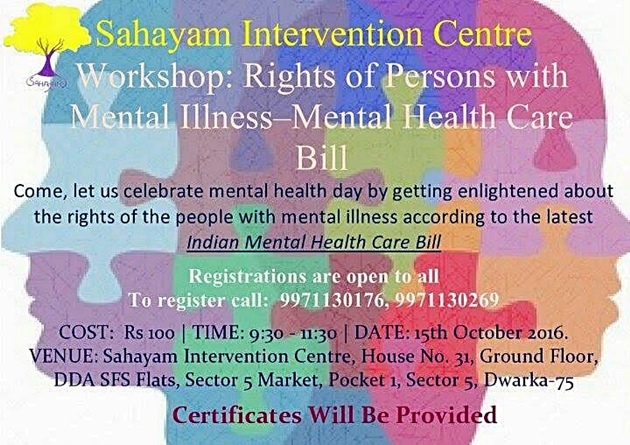 As a part of celebrating WORLD MENTAL HEALTH DAY, Sahayam Charitable Trust is organising a community awareness workshop on RIGHTS OF PERSON’S WITH MENTAL ILLNESS – MENTAL HEALTH CARE BILL, 2016. Description: Rights of people with mental illness according to the latest MENTAL HEALTH CARE BILL, 2016 which was recently passed by the Rajya Sabha.